Update (4:20 pm ET): Nancy Pelosi, the House Democratic leader, has chimed in with the most strident criticism yet of Trump's decision to oust Sessions, claiming that the decision appears to be "a blatant attempt by Trump" to undermine Mueller. She added that Whitaker should recuse himself from the Mueller probe. Of course, we know Whitaker wouldn't even consider recusal, given it would be tantamount to political suicide, particularly after what just happened to Sessions. Update (3:55 pm ET): Jeff Sessions was reportedly informed on Wednesday by phone that Trump wanted his resignation. And now that Sessions' former Chief of Staff Matthew Whitaker has taken over as acting AG, he will also assume control of the Mueller probe, according to Bloomberg. Unsurprisingly given Trump's well-documented ironic aversion to firing people in person, Chief of Staff John Kelly reportedly delivered the news to Sessions in a phone call. Mueller declined to comment on the matter, according to spokesman Peter Carr. 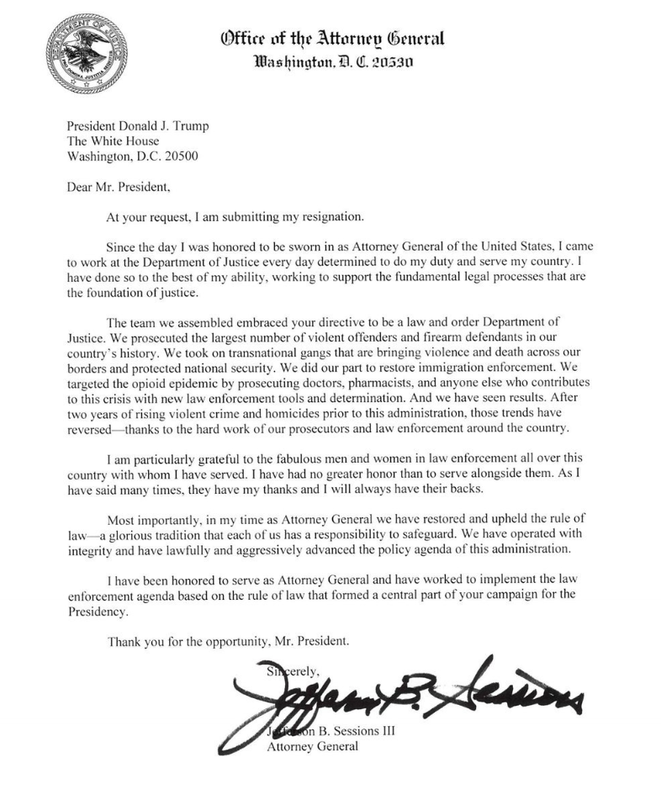 Just one day after Republicans expanded their majority in the Senate, President Trump revealed in a tweet that Attorney General Jeff Sessions has resigned. Matthew G. Whitaker, Sessions' chief of staff, will become acting Attorney General until Trump can win a confirmation for Sessions' replacement from the Senate. Whitaker is expected to be sworn in by end of day Wednesday. Session confirmed that he is resigning at the president's request. As speculation turns to the fate of Deputy AG Rod Rosenstein, the White House has confirmed that Rosenstein will remain in his role (for now, at least). This is key, because Rosenstein, who oversees the Mueller probe, was reportedly on the cusp of resigning back in September after a NYT story which alleged that Rosenstein had tried to corral members of Trump's cabinet to invoke the 25th Amendment to remove Trump, even reportedly suggesting that senior officials surreptitiously record their conversations with Trump. After that story broke, Whitaker was briefly rumored to be a possible replacement for Rosenstein before Roz and Trump purportedly buried the hatchet. Immediately after Trump announced Sessions' resignation, Chuck Schumer, the top Democrat in the Senate, said in a statement of his own that protecting the Mueller probe would be paramount. Since Whitaker hasn't recused himself from the probe, he will become the senior DOJ official overseeing the Mueller, whose investigation is said to be winding down after a handful of departures from his team of prosecutors. This could be a problem for the veteran prosecutor, because Whitaker, a former US attorney for the Southern District of Iowa, said during a stint as a conservative commentator that the Mueller probe was a "witch hunt" and that he believes Mueller has violated the law by looking into Trump's finances and venturing beyond the original scope of the investigation. What's more, Whitaker could try and gut the Southern District of New York's investigation of the Trump Organization and other probes related to the president's dealings before he took office, per Bloomberg. "An acting attorney general could do a lot of damage," said Martin Lederman, a former top Justice Department official and Georgetown University law professor. In July 2017, Whitaker said during an interview on CNN that he could envision a scenario where the AG doesn’t fire Mueller, but instead "just reduces his budget to so low that his investigations grinds to almost a halt." This has fueled speculation that, if Whitaker does take over the probe, that he would suspend the "memorandum of independence" that Rosenstein gave Mueller. Whitaker also lashed out at Mueller for his allegedly illegal overreach in an editorial published on CNN.com in November 2017. Schumer added that the timing of Sessions' firing is "extremely suspect" - though most of Washington probably inferred that Sessions' days were numbered once it became clear Tuesday that Republicans would expand their majority in the Senate. Incoming House Judiciary Chairman Jerry Nadler demanded that Trump offer an explanation for why he fired Sessions. Apparently, Nadler doesn't follow the president on twitter. Speculation has been mounting for months that Trump would fire Sessions - whom Trump has publicly criticized in interviews and tweets over Sessions' decision to recuse himself from the Mueller probe. Many believe South Carolina Lindsey Graham will be tapped to replace Sessions, speculation that has only intensified following Nikki Haley's decision to resign as UN Ambassador, which some believe she did to set herself up to succeed Graham (Haley previously served as governor of South Carolina) should he be tapped for Trump's cabinet. Sessions' ouster also follows Trump's decision to try and bait House Democrats into investigating him by tweeting that "two can play that game" and saying during a press conference on Wednesday that he wouldn't work with Democrats on legislation if they tried to subpoena him. Trump also boasted on Tuesday that he could "end the Mueller probe right now" if he wanted. And, as it turns out, Democrats are probably afraid that, as they inch closer to acquiring subpoena power, the president might be leaning toward doing just that.